In the above video, Michael J. Chapman, American Heritage Research, connects the “Sustainable Development” dots to education. This video explains how public school curriculum has been hijacked to ensure that a whole generation is ready to accept the collectivist system of government control without a word of protest. Presented at the 2008 Freedom21 National Conference in Dallas, Texas. …..many public schools have been teaching religion for years without calling it that. In their recent book, Facts Not Fear, Michael Sanera and Jane Shaw studied 100 children’s books on the environment being used in schools. What did they discover? That many of the books advocate a kind of salvation through environmental activism. Teaching “Sustainability” is a GLOBAL curriculum. 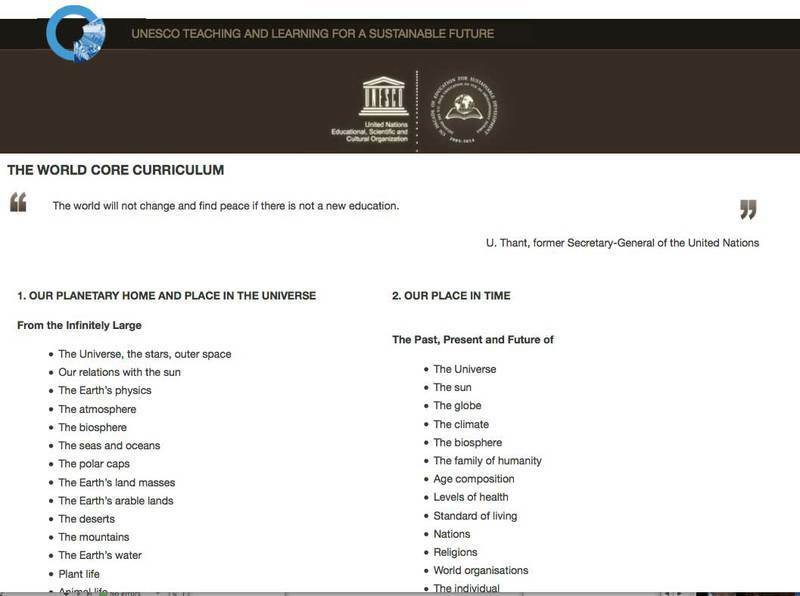 Robert Muller, assistant Secretary-General at the United Nations created a “World Core Curriculum” and is known throughout the world as the “father of global education”. Dr. Muller joined the U.N. when it was first forming in the 1940s and devoted the next 40 years of his life behind the scenes at the United Nations focusing his energies on world peace. Sustainability Education is a central agenda from the United Nations. Initially, it was called “Agenda 21” when written into soft law in 1992 at the Rio Earth Summit. To learn more about Agenda 21 and what it entails, we have provided the following information and links. Businesses – and their jobs – are fleeing California at breakneck speed because of costly, even abusive, regulations meant to adhere to UN standards. Is your state next? The Earth Summit’s Agenda 21 and other radical proposals — supposedly intended to save “Mother Earth” — will bring untold human suffering and ecological damage. Ownership of the fruits of one’s labor is essential to liberty. By its efforts to abolish the right to private property, the UN has shown that it cares nothing for individual freedom. Sink the Law of the Sea Treaty! To UN family planners, human life is not sacred but is a plague afflicting “Mother Earth” that needs to be cured by coercive population control programs.